✅ ALL SEASONS - An adjustable temperature-regulation panel allows you to easily control the temperature and keep baby and mom or dad cool or warm depending on the situation; zips-up for warmth and zips-down to reveal cool, breathable, 3D mesh. You'll absolutely love this function! You can save money with the Universal, because it's appropriate all throughout the year so you no longer need to buy both regular and cool mesh baby carriers. ✅ 6 ERGONOMIC CARRY POSITIONS - The structured bucket seat adjusts to keep your baby ergonomically seated in every development stage, starting from DAY 1 through all the baby wearing years. Ergonomic positions include: Front-Newborn, Front-Infant, Front Facing Out, Front-Toddler, Hip and Back. 360-degrees of options for your baby to face! No extra infant insert needed for newborn babies. ✅ UNIVERSAL ERGONOMIC FIT - The patent pending adjustable seating position and ergonomic bucket seat perfectly adjust to your growing baby, and enable your baby to be seated in an optimal natural "M shape" position from newborn to toddler (7-45 lbs). The Universal carrier has been acknowledged as a "Hip-Healthy" product by the International Hip Dysplasia Institute. Our ergonomic design and multiple adjustments provide a universal and perfect fit for your entire family. 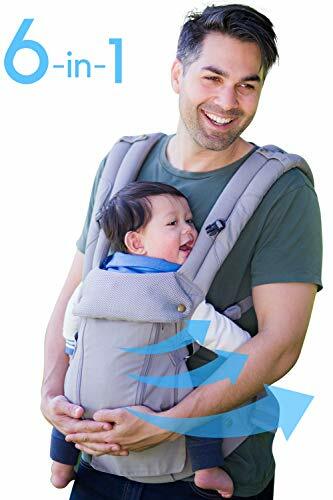 ✅ ULTIMATE COMFORT FOR PARENTS - The extra-padded crossable shoulder straps, wide and sturdy waistbelt, and lumbar support alleviate pressure on your back and shoulders and evenly distribute baby's weight between the hips and shoulders. Especially the lumbar support and waistbelt maintain healthy posture and alignment and prevent lower back strain. Enjoy superior comfort! ✅ SAFETY & "EXTRA MILE" CARE - Safety First! All parts of the Universal passed international safety standards (ASTM F2236 and EN 13209) and it's made with soft fabrics and materials that are safe and free from health-hazardous substances, so your baby is absolutely safe! On top of 60 DAYS 100% MONEY BACK GUARANTEE, we currently offer 3 YEARS WARRANTY so that you can buy and enjoy the Universal with a peace of mind. This Special Offer Ends Soon, So Order Yours Now!! !